With the holidays right around the corner, there are a lot of decisions to be made. Are we travelling this year? When do we go see Santa? What are we getting the boys?? In addition to getting them the latest toys and books they want, I’m always looking for new and cute gift ideas that are functional, practical, and that I think my boys would love – and I’ve found the perfect fit this year in the Monster Buddy Body Pillow from Two Hippos. The Monster Buddy Body Pillow is large, super cozy body pillow made for kids that is great for promoting good sleep posture (I know that from years of sleeping with a body pillow myself). It is made with memory foam, so it’s very comfortable to lie on and snuggle with. There is a storage pocket on the back that houses a soft coordinating fleece blanket – making the Monster Buddy perfect for travel. 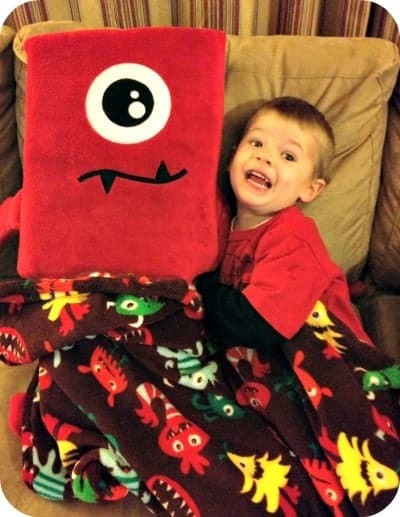 We received a Red Monster Buddy for review and from the minute it arrived, my oldest son was in love! He gets a kick out of the friendly monster face on the pillow, and loves to lounge on it during the day and snuggle up with it at night. This is definitely going to accompany us on our holiday travels this year. With a machine washable cover, this buddy is kid-friendly and easy to clean. 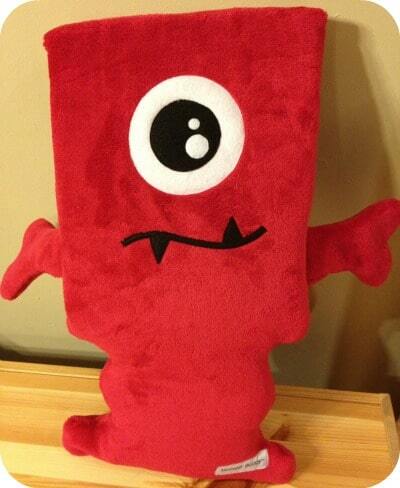 The Red Monster Buddy Body Pillow sells for $65.99. The Monster Buddy Body Pillows come in a range of colors and styles perfect for boys and girls. It makes a great holiday gift – especially for kids that travel a lot with their parents or like to stay overnight with grandparents or friends. I’m going to have to get a second one for my youngest since my big guy doesn’t want to share his! Two Hippos was started by the parents who created the popular Wall Bumpi for children’s beds (the winner of the 2012 Huggies Mom Inspired Grant prize!). They have since expanded their product line to include the Cot Buddy Cot Mat and the Monster Buddy Body Pillows. To see what Two Hippos has to offer, check out their website. You can also find them on Facebook. Isn’t that the cutest thing ever!! my son would love this as well. He absolutely loves stuffed animals and loves to cuddle with them at night, and I know he would love to sleep with this monster! Especially since it would be bigger than his stuffed animals! My grandmason would love to have one for christmas. This is really neat ! I would buy this for my kids ! Great idea. Thanks for making Christmas so much easier for us! these are really cute. I’ve never heard of them before. Thanks for sharing this great idea! We recently bought our son a body pillow and he loves it. It’s his new favorite thing. 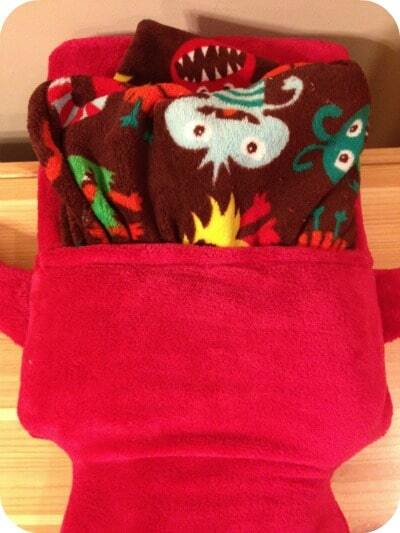 It doesn’t have a storage pocket for his blanket though, that’s a cute idea! That’s adorable, I bet my nephew would love this, might just change my gift idea to this. Cute idea! Body pillows are comfortable and useful. How great that there are fun ones for kids. I like that this was created by parents, too. so cute. My daughter would absolutely love one of these! Makes me wish my kids were younger! Very cute!